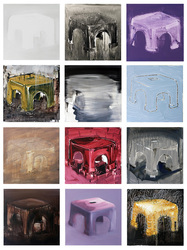 What Sze Yang has embarked on is a never-ending exploration, whereby paintings constitute apt footnotes to our tumultuous world, as well as the means and strategies for rediscovery. 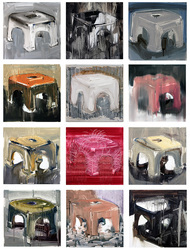 In The Twelve Apostles, we see what appears to be the sort of small, plastic stool found in countless homes. On closer inspection, however, the stool is reminiscent of the structure of a cathedral. It has an arch on each of its four sides, with the top corresponding to a celestial vault. 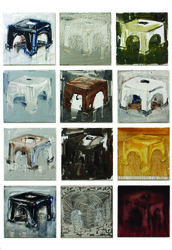 A stool serves to complement the structure of the human body by providing height and the means for rest; the titular apostles are similar in the sense that, to the seekers of Truth, they represent temporary repose to the weary, as much as they are (metaphorically) a lamp for guidance and a sweet spring in the desert. It is laudable that Sze Yang has managed to find and make use of such a link between the two, which one would normally imagine to be totally unrelated to each other.